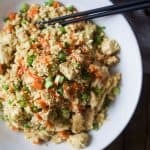 Easy 15 Minute Cauliflower Chicken Fried Rice that’s way better than takeout and tons healthier for you. Only 205 calories a serving! Add cauliflower florets to a food processor or blender. Blend until cauliflower resembles small grains of rice. Set aside. Heat a wok or large skillet to medium high heat. Add in 1 tablespoon of sesame oil to pan. Next add diced chicken. Saute chicken for 4-5 minutes, tossing throughout. Push chicken over to one side of the pan, add 1 tablespoon of sesame oil on the other side along with carrots, onion, garlic, and sweet peas. Saute the vegetables for 4-5 minutes. Next add in the cauliflower rice, along with the tamari sauce and sriracha sauce. Toss everything together and cook for 2-3 minutes.